Great South Run - Done! 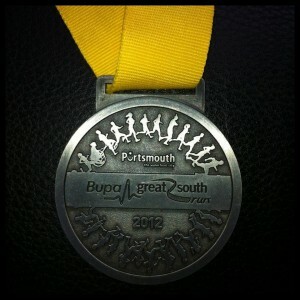 Great South Run – Done! After 4 months of training today was race day! At the time I signed up for the Great South Run the only thing I ran was a bath. My first training run nearly killed me and had I not signed up beforehand I probably would have decided it was a stupid idea and stopped there and then. So why did I want to do the Great South Run? Well, when I was a kid my Dad completed the Southampton Half Marathon and ever since then I have wanted to follow in his footsteps and complete a long distance run. I’ve considered doing this several times before, but have never followed through, until now. I recently discovered that the Great South Run started in Southampton and I believe it actually replaced the Southampton Half Marathon, so not only did I do a run like the one my Dad, I ran the 2012 version of the actual race he ran. I did this in a year that marks the 25th anniversary of him running the Southampton Half Marathon. When I signed up my only target was to finish. As such I signed up with an estimated finished time that meant my race number put me in a race position of 23,240 out of 25,000. During my training I knew I would finish in a better place than this, but had no idea of just how quick I would finish the race. My official time was 1 hour 23 Minutes and 45 seconds, placing me 3,985 out of 25,000 runners. I’m very happy with that. My Dad ran the Southampton Half Marathon in aid of the Cystic Fibrosis Trust, to raise money to help my cousin’s sonAdam and over children like him. Suddenly it feels like fate that I chose this year not only to be my year without beer in memory of both my Dad and Adam, but also that I decided to take up running as part of it. Please show some love by visiting my just giving page or donating by text – send AYWB55 and the amount to 70070. For example, texting “AYWB55 £5″ will donate £5.